Getting the "Font not set" error? Make sure both the Font -> Font Face, as well as the Bars -> Font Face is properly set to a valid font. You can always get the latest release of this addon on Curse. Please post your comments, questions and suggestions for this addon there. Currently TipTac comes with a few presets, these are a collection of preset settings. You can find the presets in the options. I am looking for more layout presets to include in future releases of TipTac. So feel free to post your saved settings. TipTac does not only configure the tip for units, you can also use TipTac to modify other tips in the WoW Interface. The way they are getting modified are both in scale and appearance. The border and background of the modified tips can be changed to colors of your desire. You can disable this appearance change by disabling the option "Hook Special Tips" under the General tab of the options dialog. Currently these tips are getting modified, but you can add more if you wish by editing the "TipTac\core.lua" file. GameTooltip, ShoppingTooltip1, ShoppingTooltip2, ShoppingTooltip3, ItemRefTooltip, WorldMapTooltip, AtlasLootTooltip and QuestHelperTooltip. There are two other addons, included in the TipTac package, which improves tip functionality in WoW. First one is "TipTacTalents", which will show player talents in the tip. The second addon is "TipTacItemRef", which improves the look of the ItemRefTooltip, which is the one shown when clicking on an item, spell or achievement link in the chat. Please refer to each addon's readme.txt file for more information regarding their functionality. If you prefer to have TipTac configured differently on each of your characters, you will have to manually edit the "TipTac.toc" file. In this file, you will have to locate "SavedVariables", and change it into "SavedVariablesPerCharacter". You must restart WoW for it to take effect, and it will reset your current settings. It's still not showing mouseover tooltips with shift+click from chat window (comparison tooltip), the frames are just blank with no text, only icons. An uptade would be much appreciated! As of 8.1.5, when I want to compare equipments at chatboard, tiptac doesn't appear, but it shows when I compare equipments in bags. And when I forbade tiptac, I could see the tips of equipments. As of 8.1.5, when you hover world quests on the map, the tip constantly blinks, between what appears to be two different sizes or panels. There is no associated Lua error, but enabling Tiptac with all other addons disabled produces the error, so I am pretty sure this one is the culprit. Yes it is. Although, I feel like having Hardware Acceleration removed from the new patch caused it. 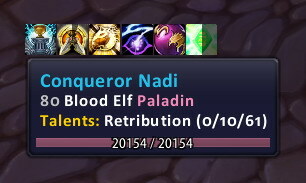 Hopefully, this addon gets updated to 8.1.5 with all the bugs fixed because this kind of addon should have been baseline option in the game imo. There are many addons that should be baseline, but blizzard ya, im gonna stop there. The options "Show Item Tips with Quality Colored Border" do not work for me since 8.1.5. Thx for this temporary fix. I wish we could get an oficial update! Thanks for the fix, however the better question is why does this fix it? Can we expect any updates soon? Mine still says out of date, has said that for a few months. Any know how to make Tiptac scaleing not influence Oufftiter scaleing? I've been using TipTac since forever and I want to say thanks for the time you have put into developing and maintaining it. Targeting you text, how do I change the colour of this text please? I used to have it so the <<YOU>> was in red font but I can't see that option. I'm pretty certain from memory I have to type something extra in that box, like a font code of some sort but not sure how. Use this format |cAARRGGBB, AA is alpha and should just be left as ff. How do I disable the raid information from showing up when I hover over someone? That must be another addon you have installed, it's not TipTac, and I don't think it's part of the default UI.